Kiss those Pop-Tarts goodbye! These toasty-good b-fast treats pack in 5g of fiber each, and they are SOOOO good. Yee-haa! These aren't LARGE... but you get to eat THREE. And each one is frosted with goo that tastes like the love child of white chocolate and Oreo creme. Tasty! OMG! These are ooey, gooey, and EXTREMELY delicious. You will NOT be disappointed if you chomp into either of these new bars. We've said it before and we'll say it again -- this is the way to do chocolate milk! 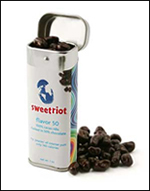 Throw a Splenda packet in, and you're good to go! Oooh, nothing says comfort like a cup of cocoa. On a scale of 1 to 10, this guilt-free mix ramps the comfort level up to an 11! And for just 25 calories?!?!?! AAAAAAH! These are meant for kids, but who cares?! We LOVE 'em! Make your Unsweetened Chocolate Almond Breeze extra chocolatey, cocoa-up your Unsweetened Vanilla Almond Breeze (or light vanilla soymilk), or turn your ordinary iced coffee into an iced mocha. Weeeeeee! The Triple Chocolate Chunk VitaTop! For those of you (and us!) who LOVE the salt-sugar thing, Mister Salty himself put together the sweetest combo. Chocolate + pretzels = so good we're glad it's portion-controlled. These people know what they're doing! 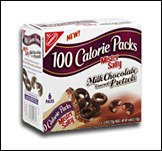 They've transformed their popular candies into little 100-calorie bundles of joy! Just don't go eating, like, five of them. Trust us, you'll be tempted. The days of gazing longingly at the checkout candy rack are OVER! Tackle your craving for cookie, caramel, and chocolate with one stick. Mmmmmm! Great news! Those are the stats for the ENTIRE TIN! These are little cacao nibs dunked in some SERIOUS chocolate. But they're not for your average milk-chocolate crowd. They come in three varieties, ranging from the mild Flavor 50 (dunked in 50% dark chocolate) to the intense Flavor 70 (dunked in 70% dark chocolate with espresso). These have only 1 - 2 calories per piece (or as they say on the tin, "peace"), and you don't need to eat too many at once -- that tin'll likely last you awhile. Plus, they pack a WHOLLOP in the antioxidant department! Yay! Death By Chocolate Cupcakes - The world's most perfect no-guilt chocolate cupcake. Swirls Gone Wild Cheesecake Brownies - Doesn't the name say it all? Chocolate Peanut Butter Fudge - 3 ingredients, people. THREE!!! Did you know there is an ENTIRE CHAPTER devoted to chocolate in our book, Hungry Girl: Recipes and Survival Strategies for Guilt-Free Eating in the Real World? It's true! Click here to buy it! HG News You Can Use! Change your eating habits for the better this fall. Weight Watchers ROCKS and they can help. Click here NOW! Don't HOG all the HG choco finds! Share this email with pals. Click "send to a friend" NOW!!! !